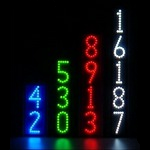 Pricing table for LEDress lighted house numbers--free shipping to USA and Canada. Use this page to figure the dollar amount when using the printed mail-order form. Two greens--only cool green LEDs are pictured here; for plain green, see Home or Pictures pages. 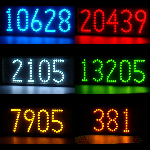 Orders are filled in 1 to 3 days, delivery can take 2--4 days (USA), or up to 2 weeks (Canada). Ordering: use link below (or via Show Menu link for small screens). Note: Most horizontal unit orders will not exceed $99, meaning that if mounting or wiring kits put you over that limit, you save a few dollars. See the "Specials" page for details.